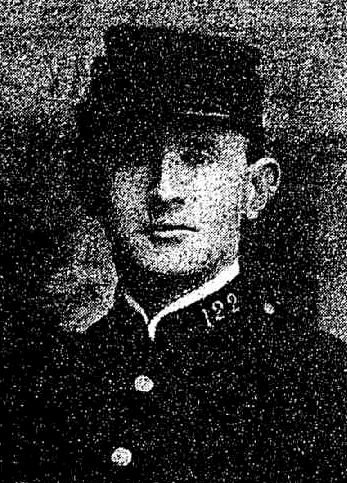 Constable Harrie Leeds was killed in a tramway accident at McMahon’s Point, Sydney on Thursday 21 August, 1924. Another man was also killed and several people were injured in the incident. Incredibly, the Inspector General of Police Mr James Mitchell did not consider this death to be “killed on duty”. This decision was later the subject of numerous unsuccessful representations by the Police Association of New South Wales. It was at the very least the death of a constable travelling to work, regardless of other factors and disputed facts. And again, the Sydney Morning Herald dated 2 October, 1924 reported a lengthy description of the coroner’s findings, including the following extract. Herbert Gillies Ruthven, a passenger on the tram, described his experience. He said that shortly before the smash he had been conversing with the deceased Leeds. Leeds seemed frightened when the tram had gathered speed while descending the other declines on the route from Victoria Avenue. [Ruthven] had said to him, “How about getting off here, Leeds, and walking down?” That was when the tram stopped at East Crescent Street. Just then the tram started, and the constable did not reply. Witness next saw him crouching in a hesitating manner as if he were about to take the risk of jumping from the tram. He was still on the footboard when the tram first left the rails. The constable was born in 1885 at Trial Bay, New South Wales and joined the New South Wales Police Force on 28 May, 1907. At the time of his death he was stationed at George Street North Police Station. He lived at Willoughby and had previously served at Goulburn, Araluen, Crookwell, North Sydney and Phillip Street Police Stations. HARRY LEEDS, 47, of Penkivil-street, Willoughby, a police constable attached to the George-street North station. FREDERICK MAURICE LAMBERT, 30, engineer, of the corner of Alleyne and Mann streets, Willoughby. LEEDS – The Relatives and Friends of the late Constable HARRY LEEDS are invited to attend his Funeral ; to leave his late residence, Innisfail, Penkivil-street, Willoughby, THIS FRIDAY, at 2pm, or Catholic Cemetery, Northern Suburbs. WOOD COFFILL LIMITED, Funeral Directors. LEEDS. – The Relatives and Friends of Mrs. ALICE E. LEEDS and FAMILY are invited to attend the Funeral of her beloved HUSBAND and their FATHER, Harry ; to leave Innisfail, Penkivil-street, Willoughby, THIS FRIDAY, at 2pm for Catholic Cemetery, Northern Suburbs. LEEDS – Relatives and friends of Mr. HARRY LEEDS, Senior, and Miss ELSIE LEEDS, of Parramatta, are invited to attend the Funeral of his beloved SON and her BROTHER, Harry ; to leave Innisfail, Penkivil-street, Willoughby, THIS FRIDAY, at 2pm, for Catholic Cemetery, Northern Suburbs. LEEDS.- The Friends of Mr. and Mrs. NEIL BOYLE, Mr. and Mrs. FRANK PALMER, Mr. and Mrs. Neil LEEDS, Mr. and Mrs. RICHARD LEEDS, of Summer Hill, are invited to attend the Funeral of their beloved BROTHER, Harry Leeds ; to leave Innisfail, Penkivil-street, Willoughby, THIS FRIDAY, at 2pm, for Catholic Cemetery, Northern Suburbs. LEEDS – The Friends of Mrs. O’REGAN, ELLA & DONA HOWE, of Cairo-Street, North Sydney, are invited to attend the funeral of their beloved SON-IN-LAW and BROTHER-IN-LAW, Harry Leeds ; to leave Innisfail, Penkivil-street, Willoughby, THIS FRIDAY, at 2pm, for Catholic Cemetery, Northern Suburbs. LEEDS. – The Friends of Mr. and Mrs. J. T. LEVITT and FAMILY, of Ashfield, are invited to attend the Funeral of their beloved BROTHER-IN-LAW and UNCLE, Harry Leeds; to lave Innisfail, Penkivil-street, Willoughby, THIS FRIDAY, at 2pm for Catholic Cemetery, Northern Suburbs. LEEDS – N.I.O.O.F., LOYAL PERSEVERANCE LODGE – The Sisters and Brothers of the above lodge are invited to attend the Funeral of the late Brother H. LEEDS; to leave his late residence, Innisfail, Penkivil-street, Willoughby, at 2pm TODAY. A large crowd attended the funeral of Constable Harry Leeds, one of the victims of the North Sydney tramway smash, to-day. It was striking tribute to a popular officer. The cortege, which left his home in Penkivil-street. Willoughby, for the Northern Suburbs cemetery, was headed by the Police Band playing the Dead March. About a hundred police representative of the whole metropolitan division, besides a number of tramway men marched in procession. The principal mourners were the widow and five young children, Mrs. Boyle, Mrs. Benn, Mrs. Davison, Mrs. Dickman, Mrs Palmer and Miss Elsie Leeds (sister). Mr. Harry Leeds (father). Messrs. Neil and Richard Leeds (brothers). Among those present were Mr. James Mitchell, Inspector-General of Police, Inspector Souter, North Sydney, Mr. G. Holt. District Superintendent of Tramways, North Sydney – (representing the Tramway Department), Mr. Charles Thackeray (representing the Police Association). Many beautiful wreaths were sent by the police. Including several from C.I. Branch and No. 4 Division. The funeral of Constable Harry Leeds, who was killed in the tram accident at McMahon’s Point, took place yesterday afternoon in the Roman Catholic portion of the Northern Suburbs cemetery. A large crowd assembled in the vicinity of the late Constable Leed’s home in Penkivil- street, Willoughby, and, as the coffin was placed in the hearse, the crowd stood bare-headed, while Inspectors Beatty (George-street North station), to which Constable Leeds was attached and Souter (North Sydney) stood at the salute, at one side, and members of the Loyal Perseverance Lodge (Independent Order of Oddfellows) stood at the other side. The Police Band, with muffled and draped drums, led the procession, and following the band, there came between 50 and 60 non-commissioned officers and men of the police force, representing 15 divisions. Marching immediately in front of the hearse were the Inspector-General of Police (Mr. James Mitchell) and Inspector Souter. The pall-bearers were Constables Cole, Hansen, Malcolm (No. 6 Division), and Jackson, Kerr, and Reece (No. 4 Division). Following the hearse were the mourning coaches conveying members of the family and other relatives of the deceased, then came members of the Loyal Perseverance Lodge, and about 30 motor cars and other vehicles, conveying friends of the late constable. The route from the late Constable Leeds’s home to the cemetery was between three and four miles, and practically all the way crowds gathered to view the procession. 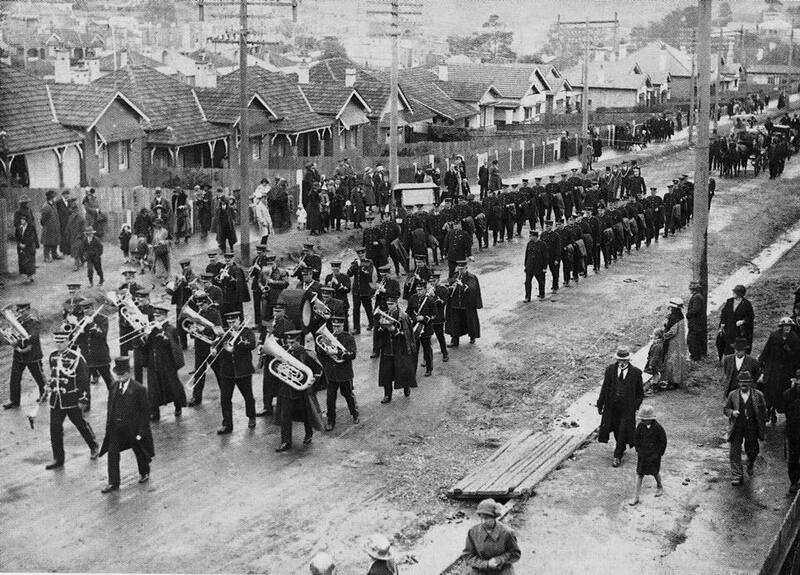 A large number of people had assembled at Mowbray-road, and as the procession passed into the main street of Chatswood to the strains of the Dead March the scene was a solemn and striking one. The sidewalks of the thoroughfare were crowded, the men standing bare-headed, and the police on street duty standing at the salute as the hearse passed. After crossing the railway line at Chatswood the Police Band and members of the force opened out and halted while the procession passed through. Motor buses conveyed the band and police to the entrance to the cemetery, and on arrival of the hearse and mourners the procession was again formed and marched to the grave. The Rev. Father J. Wall officiated at the graveside, the service being simple but impressive. The principal mourners were Mrs. Leeds (widow) and five young children, Messrs. Harry Leeds (father), Neil and Richard Leeds (brothers), and Mrs. Boyle, Mrs. Palmer Mrs. Benn, Mrs. Davidson, Mrs. Dickman, and Miss Elsie Leeds (sisters). Others present Included Mr. G. Holt, District Superintendent of Tramways, North Sydney (representing the Tramway Department), District-officer F. A. Tuck, Crow’s Nest (representing the New South Wales Fire Brigade), Mr. Charles Thackeray (representing the Police Association), ex-Inspector J. Fullarton, Aldermen J. S. Muir, W. L. M. Fry, E. J. Parkes (Willoughby Council), and Messrs. G. A. Bailey (town clerk), Hughes (health Inspector), and Murdock (building Inspector), H. B. Perringnon (Department of Labour and Industry), T. Proctor, H. C. Coulter, P. K, Gorrick, and E. Hewitt. At North Sydney Police Court yesterday appreciative remarks regarding the late Constable Leeds were made by Mr. Daley and Mr. Thomas on behalf of the legal profession. Mr. Daley said that he had known Constable Leeds for 15 years, and he was an efficient, courageous, and loyal officer. Inspector Souter expressed regret on behalf of the police force, and said that it was unfortunate that Constable Leeds had left a widow and five young children. He was sure, however, that the police as a body would not fail to alleviate the suffering of the late constable’s relatives. The recent tram accident at North Sydney was the cause of the death, of Constable Harry Leeds. Constable Leeds was one of the most popular men in the metropolitan area, and news of his death came as a severe shock to his colleagues. He joined the force in 1907, and was appointed to Goulburn, where he was married, and transferred to Araluen. From there he was sent to Crookwell, and later on to North Sydney, where he did duty for a number of years; but for the past five years he was connected with George-street North Police Station. On the 22nd ult., at the North Sydney Police Court, Mr. Daley and Mr. Thomas, on behalf of the legal profession, paid a tribute to the worth of Constable Leeds, and offered their deep sympathy to his relatives. Inspector Souter said they could ill afford to lose such men of long service and experience. Constable Leeds leaves a widow and five young children, the youngest being a boy only six months old. The funeral was an impressive tribute to the memory of deceased. The Police Band, under Bandmaster Hawkins and Drum-Major Flynn, together with a squad of sergeants and constables, drawn from the whole of the 15 divisions of the Metropolitan Police Force, led the cortege, and six police pals of the dead man carried the coffin, laden with wreaths. The hearse, too, was piled with wreaths. The Inspector-General of Police (Mr. Mitchell) walked in the cortege, accompanied by Inspectors Beatty and Souter. The pall-bearers were Constables Cole, Hansen, Malcolm (No. 6 Division), Jackson, Kerr, Reece (No. 4 Division). Also in the cortege were Mr. G. Holt (District Superintendent, North Sydney), representing the Government Tramways Department), District Officer F. A. Tuck (representing New South Wales Fire Brigades), Mr. C. Thackeray (representing Mr. B. Fortesene and Police Association), Alderman Muir (representing the Mayor and Alderman of Willoughby). First-Class Constable Walsh marshalled the cortege to the Catholic portion of the Northern Suburbs Cemetery. The streets through which the cortege passed were lined on each side with thousands of people, who stood with bowed heads. Arriving at the cemetery, the police formed an avenue, through which the cortege passed, and Rev. Father J. Wall, of Ryde, officiated at the graveside. The chief mourners were: The widow and five children, Mr. Harry Leeds (father), Neil and Richard (brothers), Mesdames Boyle, Benn, Davison, Dickman, Miss Elsie Leeds (sisters) Mrs. O ‘Regan, Mrs. Levett, Miss Howe, Miss O’Regan (mother and sisters of the widow). — R.I.P. THE LATE CONSTABLE HARRY LEEDS. Constable Leeds, the victim of the recent tram accident at North Sydney, was one of the most popular men in the metropolitan area, and news of his death came as a severe blow to his colleagues. He joined the police force in 1907 and was appointed to Goulburn, where he married. He was transferred to Araluen, and from there he went to Crookwell, and later on to North Sydney, where he did duty for a number of years. For the past five years he had been connected with George-street North Police Station. On August 22, at the North Sydney Police Court, Mr. Daley and Mr. Thomas, on behalf of the legal profession, paid a tribute to the worth of Constable Leeds, and offered their deep sympathy to his relatives. Inspector Souter said they could ill afford to lose men of such experience and long service. Constable Leeds leaves a widow and five young children, the youngest being a boy only six months old. The funeral, which took place on Friday, August 22, was an impressive tribute to the memory of deceased. A large concourse of people gathered at ‘Innisfail,’ Penkivil-street, Willoughby, and genuine sorrow was manifested, particularly among those who knew the bond of affection which existed in the domestic life. At 2 p.m. the Police Band, together with a squad of sergeants and constables drawn from the whole of the fifteen divisions of the metropolitan police force, formed up outside, and six police pals of the dead man carried the coffin, laden with wreaths. The hearse was piled with wreaths. As the coffin was borne out, Inspectors Beatty (George-street North) and Souter (North Sydney) stood at the salute at one side, and six members of the Loyal Perseverance Lodge (I.O.O.F.) with bowed heads at the other. The Inspector-General of Police (Mr. Mitchell) walked in the cortege, accompanied by Inspectors Beatty and Souter. The pall-bearers were Constables Cole, Hansen, Malcolm (No. 6. Division), Jackson, Kerr, and Reece (No. 4 Division). Also in the cortege were Mr. G. Holt (District Superintendent of North Sydney; representing Government Tramways Department), District Officer F. A. Tuck (representing N.S.W. Fire Brigades), Mr. C Thackeray (representing Mr. B. Fortescue and the Police Association), Alderman Muir (representing the Mayor and aldermen of Willoughby); Mr. Scott Fell was also represented. First-Class Constable Walsh marshalled the cortege to the Catholic portion of the Northern Suburbs Company. The Police Band, under Bandmaster Hawkins, with Drum-Major Flynn at its head, led off with the ‘Dead March in Saul.’ The Loyal Perseverance Lodge (N.I.O.O.F. ), with N.G. Bro. C. Bolger and Secretary Bro. Dimond, were also in the procession. The streets, through which the cortege passed, was lined on each side with thousands of people, who stood with bowed heads and tear-dimmed eyes. Arriving at the cemetery, the police formed an avenue through which the cortege passed, and the Rev. Father J. Wall, of Ryde, officiated at the graveside. While the coffin was being lowered the Police Band played ‘Abide With Me.’ The chief mourners were the widow and five children, Mr. Harry Leeds (father), Messrs. Neil and Richard (brothers), Mesdames Boyle, Benn, Davison, and Dickman, Miss Elsie Leeds (sisters), Mrs. O’Regan, Mrs. Levett, Miss Howe, Miss O’Regan (mother and sisters of the widow). — R.I.P. The Coroner’s inquiry into the cause of the McMahon’s Point tram crash on August 21, in which Constable Harry Leeds and Frederick Maurice Lambert were killed, has been fixed for next Wednesday at 10 a.m. The City Coroner’s inquest into the deaths of Constable Harry Leeds, and Frederick Maurice Lambert, in the tram disaster at McMahon’s Point on August 21 is listed to be held tomorrow. The Sydney Coroner to-day held an inquiry, into the deaths of Frederick Lambert, aged 39, an engineer, of Willoughby, and Constable Harry Leeds, aged 47, of Willoughby, who were killed in the tram smash at McMahon’s Point, North Sydney, on the morning of August 21. It was through the alleged failure of the brakes that a double-set ran down the steep incline towards McMahon’s Point, but when rounding a curve the front car left the rails and crashed into a house. The rear car piled itself up on to the first car, and in the smash Lambert and Leeds were killed, and a number of other passengers injured. Edward Chambers, electrical subforeman in the Tramway Department, said that on August 20 the two cars, 544 and 543, went into traffic at 6.20a.m., and arrived back at 8.57a.m., and were booked up as ” O.K. ” On August 21, at 1a.m., they were again booked up as ” O.K. ” At 5.49a.m. they went into traffic again, and were in good order. At 7.50a.m. he saw them at McMahon’s Point, after the accident. It was driver’s duty to report any defects in the running of a car. Thomas Elias James, the driver of the car, was then called. He said that when they left Willoughby on the fatal trip for McMahon’s Point, he found that the controller was jambed (sic), and he could not move it one way or another. He then drove the tram from the rear of the car, and left Conductor Cowan in charge of the air brake in the front. As they neared the long hill near the terminus, he felt the car getting out of control. He attempted to use the third emergency, but found it could not be used, owing to the air control being on. He was absolutely helpless to do anything. Witness considered he had taken the best course in giving Cowan control of the air brake, as it was a very foggy morning. He attributed the accident to the greasy condition of the rails. Conductor James Cowan, who stuck to the front of the car throughout, and who suffered severe concussion when it left the rails and crashed into the wall, was the next witness. Mr. D. R. Hall, his solicitor, explained that his memory, so far as the accident was concerned, was an absolute blank, and he was still a very sick man. Consequently he was only asked a few questions. He told the coroner that he could not remember anything of the run down the hill or the final crash. Edward Wills, chief inspector, said that the working orders put the driver in charge of the tram, and the only part of his duty he could delegate to a conductor when he had to drive from the rear was the operation of the bell and the sand. Wills maintained that the driver delegated his powers to the conductor, and thereby broke the regulations. The conductor, in this case, was in charge of the tram. The Coroner: A man might easily make a mistake about the meaning of this rule. Mr. Hall: A department whose motto is “Safety first” might have expressed it in more simple English and more clearly. Constable Harry Leeds was my great grandfather. Apart from the accident, I don’t have too much information on him. He is now only survived by his great grandchildren. As our parents and grandparents have passed away, we are hoping in the future to be able to find out more information about Harry and his wife Alice and their parents.